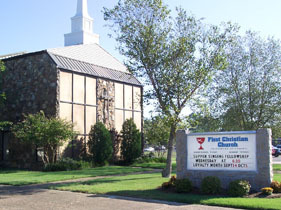 First Christian Church of West Memphis, Arkansas is a loving and caring congregation who welcomes all. Here you can find healing, wholeness, and community. We are disciples of Christ, a movement for wholeness in a fragmented world. Welcome to the First Christian Church (Disciples of Christ) of West Memphis, Arkansas. We are one of the largest mainline Protestant denominations founded on American soil. First Christian Church of West Memphis is a loving and caring congregation who welcomes all. We embrace diversity. First Christian Church is a place where you can find healing, wholeness, and community. We are disciples of Christ, a movement for wholeness in a fragmented world. We hope that you will take time to visit our entire website to learn about who we are and what we are about. But most importantly, come and get to know us and worship with us. Come and share in the freedom of Christ’s love for the world. You are welcome at First Christian Church, where you will be greeted with open arms!